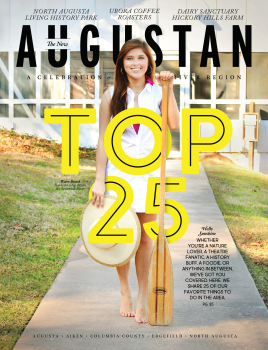 Whether you&apos;re looking for a date night or family event, or are prepping to host your friends and family for the holidays, Augusta&apos;s River Region is bustling with events and things to do. Here are some of the fun and exciting events happening around the region to help you celebrate the spirit of the season and special offers from Augusta hotels to make your stay even sweeter. How to get there: You must park at Citizens Park (1060 Banks Mill Road) and use the shuttle service to the gardens. Shuttles are available each night and will pick-up and drop-off visitors continuously from 5:45 - 9:00 p.m. Shuttle service is free. There is no general public parking at Hopelands or Rye Patch. Handicap parking is available at 135 Dupree Place. The hilarious account of Ralphie’s desperate quest to make sure the most perfect of gifts ends up under his Christmas tree! This musical version of the classic film captures holiday wonder with a deliciously wicked wit that will delight children and grown-ups alike! Don’t miss the delightful songs featuring heart-warming ballads and show-stopping leg lamp kick-lines!. Cost per person: $20 - $48 (Ticket prices based on seat location). An all-new concert experience featuring the cast of Cirque Musica together with your favorite holiday songs performed by a live symphony orchestra. Cirque Musica Holiday will bring audiences on a journey into a world of “Wonderland” with unforgettable visuals and amazing acrobats, aerialists, hilarious hijinks and holiday cheer. This is the perfect opportunity for the entire family to experience great holiday music, LIVE, while enjoying spectacular costumes, production, and an edge of your seat circus experience. Cost per person: Adult $60 - $81 / Children $25 (Ticket prices based on seat location). An African-American telling of the Nativity story, written by acclaimed African-American poet and playwright Langston Hughes and adapted by Robert John Connor. This one act musical opens in a modern day African-American church on Christmas day, filled with testifying deacons, sanctified ladies, and down-home preaching. Under the musical direction of Keith Wilson the show takes us on a journey back to the Bethlehem of Mary and Joseph, resplendent in African costumes, and moving songs of worship, magnificent dance choreographed by Dawn Axam and old-fashioned spirituals. The African-American viewpoint and the gospel music make Black Nativity a truly unique and entertaining theatrical experience. Cost per person: $27 - 54 (Ticket prices based on seat location). David Tuttle is moonlighting as a department store Santa so that he can buy his wife a fur for Christmas. He tells her he’s working late at the office, but she finds out he isn’t at the office. A suspected other woman, hypnotism, the notorious Santa burglar, Kris Kreigle and his gun-toting fiancée, and a confused policeman add up to a rollicking tale that is hilarious Christmas entertainment any time of year. Cost per person: Dinner & Show Civilians $53 / Dinner & Show Students $40 / Coffee & Dessert Show $35 / Show Only $28 (Active Duty Military prices available). Presenting world class Russian artists, hand-painted sets, Russian Snow Maidens, and jubilant Nesting Dolls – Great Russian Nutcracker brings the Christmas spirit to life for all ages. “Kids wide-eyed with delight!” says the New York Times. Experience the Dove of Peace Tour, spreading goodwill in over 100 cities across North America. Get seats now for the whole family and make memories for a lifetime at Moscow Ballet’s Great Russian Nutcracker! Cost per person: Reserved $28 - $68 / Platinum Meet & Greet $175 (Ticket prices based on seat location). The Aiken Symphony Orchestra delights in making this concert an annual tradition for the Aiken community. The afternoon will be filled with favorite, holiday melodies as well as the added bonus of including two of Aiken&apos;s beloved groups, the Aiken Choral Society & the Aiken Civic Ballet. Cost per person: $30 - $45 (Ticket prices based on seat location). The Yacht Rock Revue™ is the Greatest Show on Surf and the finest tribute to &apos;70s light rock to ever perform anywhere. Ever. Their spot-on renditions of Hall & Oats, Michael McDonald, Steely Dan, and the rest of the Time-Life infomercial Catalog have enthralled fans across the United States. Cost per person: Reserved $35 - $50 / Captain&apos;s Club $50 (Ticket prices based on seat location). This breath-taking performance is a spectacular musical and dance production that mixes classical and contemporary selections from Peter J. Wihousky to Kirk Franklin. Each performance celebrates the birth of Jesus Christ and embodies the spirit of Christmas. Cost per person: General Admission $15 - $20 / Seniors, Military, & Students $10 (Ticket prices for General Admission are different for matinee and evening shows). Dress in your best (or most unusual) holiday costume and head to the Metro Coffeehouse to pick up your passport for this fun annual pub crawl. After the crawl, stop by Sky City for the Costume Contest and raffle giveaways. Get all pub crawl locations stamped in your passport and be entered for the raffles! From classic musicals to live concerts and black box plays, Augusta's downtown calendar is full of events. Come for the show, stay for the weekend!